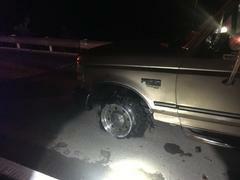 On Wednesday, March 6, 2019, at about 8:45 p.m., a Sheriff’s Deputy on Highway 101 near the Ventura County line observed a vehicle pursuit involving a pickup truck hauling a small U-Haul trailer. The truck was being driven by 52-year-old Christopher Todd Franchi of Ventura. 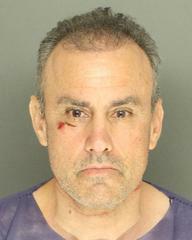 Franchi was being pursued by officers from the Ventura Police Department because he was involved in a domestic disturbance in their area. The Ventura Police officers discontinued their pursuit as Franchi continued northbound on Highway 101 near the Santa Barbara County line. The Santa Barbara County Sheriff’s Deputy followed Franchi as he continued north on the freeway. Franchi began to drive erratically, making sudden lane changes, and he appeared to intentionally drive toward other cars on the roadway. A second Sheriff’s Deputy was now following Franchi and they attempted a traffic enforcement stop on the northbound 101 near Summerland. Franchi ignored the emergency lights and sirens of the deputies and he continued northbound. Franchi continued to make abrupt lane changes, veering from side to side, intentionally driving toward other cars on the roadway, and appearing as if he were trying to make the cargo trailer that he was hauling come off of the hitch. The Sheriff’s deputies continued to pursue Franchi northbound on Highway 101 through Summerland, Montecito, Santa Barbara City, and the City of Goleta. Officers from the California Highway Patrol assisted the deputies by deploying a spike strip on Highway 101 near Winchester Canyon. 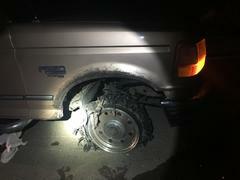 Even after running over the spike strip, Franchi continued to evade deputies until his two front tires were completely shredded and his vehicle came to a stop on the northbound side of Highway 101 near Dos Pueblos Canyon. After stopping, Sheriff’s deputies gave commands to Franchi to exit his vehicle. Franchi refused to exit the vehicle. He made statements about being armed, threatened to hurt deputies and himself. Franchi eventually exited his vehicle, but remained uncooperative and refused to obey commands.. Ultimately, Franchi was safely taken into custody with the assistance of a Sheriff’s K-9 team. Franchi was booked at the Santa Barbara County Jail on charges of Criminal Threats, Assault with a Deadly Weapon, Recklessly Evading an Officer, Resisting Arrest, and Driving While License Suspended for DUI. His bail is set at $75,000.